An interior designer is someone who has the creativity, skills, and knowledge required to design a beautiful and functional space. If you’re an interior designer looking to start an interior design business, then you’ve come to the right place. Starting your own business can be tricky, and we’re here to give you the push you need to get the ball rolling. 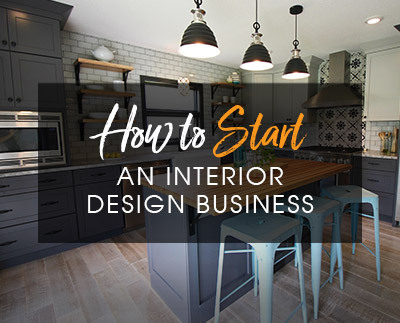 With this complete guide on how to start an interior design business, you’ll be up and running in no time. The first thing you want to plan are the types of services you’ll offer. As an interior designer, you want to make sure you’re not taking on more than you can handle. If you only want to design kitchens & baths, for example, you need to make it clear from the get-go. If you’re going the e-design route, you need to make a list of specific deliverables. These might be slightly different than if you were to offer the full interior design experience (i.e., dealing with contractors, manufacturers and suppliers). We all have our own style, and we tend to excel at what we know best. If you specialize in mid-century modern style or rustic style or traditional style, that is what you should focus on. 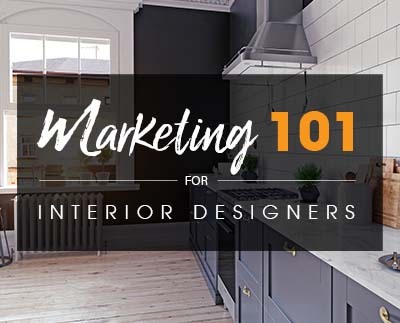 That’s not to say you need to only take on clients that share your style, but when you start an interior design business, you want to be targeting your ideal clients. Do you want to design homes for families with kids or just couples? Do you want to design both indoor and outdoor spaces? Do you only want to design kitchens & baths? You get where we’re going with this. Find your niche, find your style, and you’ll attract the right kinds of people. Now the real fun begins! You need to come up with a name for your business. It needs to be catchy, and it needs to reflect your work. Have a lengthy brainstorming session and write down all your ideas. Once you’ve chosen a business name, you need to register it with your state or province. Make sure you have all the licenses required by law to start an interior design business so you don’t run into any trouble later on. This is a no-brainer. You’re an interior designer, you create beautiful spaces, so when you start an interior design business, you need a website that matches your career. If you don’t have experience building a website, you might want to hire someone to do the job. Or you can watch tutorial videos and do it yourself (it’s not that hard, promise). Building and perfecting your website will take a while. Don’t rush things, and don’t start promoting your website if it’s incomplete. Remember – your website is a reflection of you as a designer. When you first start an interior design business, you might not have a portfolio yet – but that’s ok. You don’t necessarily need a huge portfolio at the beginning of your career. If you have images of spaces you’ve designed for actual clients, even better! You should definitely include those as well. When you’re ready to set your rate, you’re going to have to do some homework. How much do other designers in your area charge? Do you have interior designer friends/colleagues you can ask? How much experience do you have? Once you’ve decided how you want to charge your clients, you need to write out an agreement and have your clients sign a contract to seal the deal. You’ve created a gorgeous website and you’re ready to take on new clients. Great! Remember that clients won’t just randomly find your website with a quick Google search (not at first, anyway). You’ll have to promote your website and services, and you need to be aggressive about it. If you want to learn more about how you can market yourself and promote your services, check out this eBook. Once your website is set up and you’ve started promoting your services, you should look into starting a blog. Even if you’re not a writer, you’ll get the hang of it. Write posts about design tips, designs trends – anything related to design, really. Is it relevant to interior design? Does it provide useful information to your readers? If you’re going to start a blog, you need to be prepared to post regularly. Don’t start a blog if you’re only going to be publishing content once every 3 months, because potential clients who will visit your website will see that you are inconsistent. Now that you’ve taken care of the digital side of starting an interior design business, you can focus on creating a work space for yourself. We know, working in your jammies on your couch is always fun, but you’ll be more productive if you have a dedicated work space. If you have the budget to rent (or even buy) office space, by all means go for it. But if you’re on a tight budget, you can work from home and meet your clients at their home or at coffee shops. One of the smartest things you can do when you start an interior design business is to build good relationships with suppliers and contractors. You want to have connections with reliable people who will deliver exactly what you ask for, on time, every time. The more people you know and the more connections you have within the industry, the better.